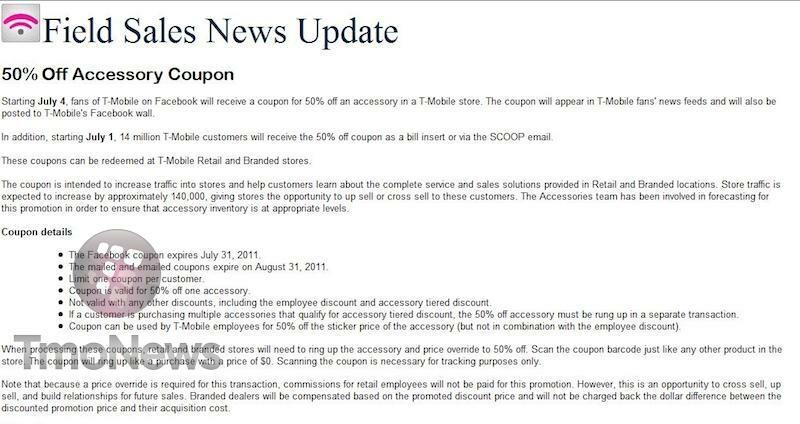 Good news T-Mobile fans if you’ve been holding off on your accessory purchases as T-Mobile is set to provide customers with 50% coupons beginning today, July 1st through your SCOOP email. If you don’t get the monthly T-Mobile SCOOP email not to worry as T-Mobile Facebook fans will have a chance to grab a 50% accessory coupons beginning July 4th. The coupon will appear in your news feed along with a post on T-Mobile’s Facebook wall. The coupons can be redeemed at your local T-Mobile corporate owned store. There is a limit of one coupon per customer and the 50% off is only good for one accessory. Of course if you want to purchase multiple accessories all you need to do is print out multiple coupons and ring up each purchase separately. The Facebook coupon will expire July 31st and the SCOOP coupon will expire on August 31st. Sounds good? Happy Fourth Of July weekend! Ooh.. maybe it’s time to get a case for my G2x, lol. I hope they start carrying MHL adapters for sensation because, even with 50% off, that’s the only thing I want to buy from T-mobile. Everything else if at least 6 times cheaper on Amazon. Obviously not, since T-Mobile doesn’t carry it. the accessory I want is gingerbread and a bug fix for my g2x!!! Like WOW! Discount accessories for my old Froyo Phone! Cool! It would be great if I had a current phone like the Sensation. My old phone is ok, but LG and TMO don’t want to support outdated hardware any more. I’ll just keep my LG G2x and the old accessories I was suckered into buying way bak when in May 2011! LOL @ the g2x being outdated. You want gingerbread? Root the phone via superoneclick and use nvflash to get clockworkmod… and flash CM7. I love my 2.3.4 aosp gingerbread 1.5ghz oc’d G2x. Just wondering, would this include bluetooth headsets? Too bad you can save more than 50% by looking for accessories on either eBay or Amazon. Womp womp..
How do people sign up to receive that email? I was wondering the same. maybe they took that feature off for this weekend so they don’t have people flooding their website to try and get the deal. To get the 50% off coupon, make sure that you are a fan of T-Mobile’s Facebook page: http://goo.gl/s5uyy. The offer will be posted on T-Mobile’s Facebook wall in the morning, Monday, July 4. The deal will be valid through July 31. I am sorry but who cares anymore. T-Mobile USA is done and dead. Last 3 times I called them I have to wait 45 minutes to talk to someone in customer service. And they talk and act the way I never saw from T-Mobile customer service. they act like they don’t care. Not really helping and even tough I have problem with my phone and in cases like this they always were changing my phone to fix the problem now they simply say no sorry. And just one customer service did his best and offer me some crappy and ugly Android phone instead of my phone. Hell no I don’t change my phone with that ugly android you can not sell. And when I said well if you guys don’t fix it and exchange my phone (still under warranty) I will cancel my contract they said ok no problem do you want us to transfer to department for cancelation!!! I am sory but T-Mobile is done. Dead! hmm I never had any luck dealing with just customer service since it seems like their very limited on what they can do and most of the time they don’t try to push it further. You should of just take the transfer and talk to the cancellation department and see if they can help you with your issue. But either way your best bet is keep on calling and hope you get someone that is willing to help you. Even if it means going through the cancellation department. Of course it will be available once the AT&T takeover happens. They now have the deal on facebook. Ooops. Nevermind, I was looking in LG. Ive had NOTHING but problem after problem with my Gravity. Very disappointed!!!!!!!! Just may ditch T-Mobile just because of it because they are NO help!!! !